Glen Roven is a composer, pianist, and impresario. 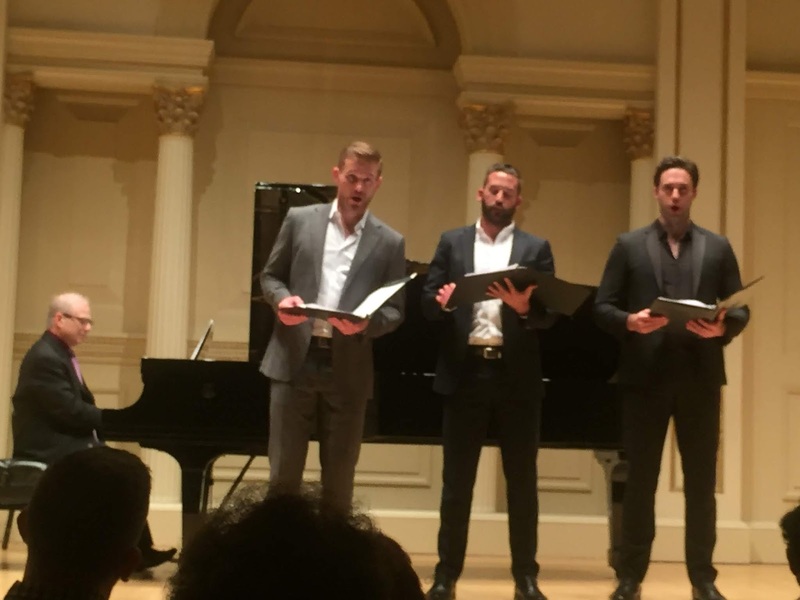 His recording company has just released a new CD-- Remember starring three rising stars of the opera world; last night a celebration was held at Weill Recital Hall. Mr. Roven mentioned that this is the first recording for each of these "exploding stars". Each of the three celebrated baritones are well known to us from Juilliard, Brooklyn Art Song Society, Santa Fe Opera, and from competitions they have won. What a treat to hear them all together! As pointed out by Amy Shoremount-Obra, there was a lot of testosterone backstage! And a lot of handsomeness, we might add. We are not fond of the designation "Barihunks" but we cannot think of a better description. From the informative program notes by pianist Michael Brofman, we learned that the baritone fach originated in the bel canto period. Who knew! More reason to appreciate Rossini, Bellini, and Donizetti. The program opened with three guest artists with low voices, men who are more advanced in their career arcs. Arranged by Mr. Roven, Ouverture dei Baritoni involved baritones Robert Wesley Mason and Kyle Pfortmiller, along with bass Branch Fields performing a medley of operatic hits in unison and also sequentially. We were delighted to hear arias by Mozart, Verdi, Rossini, Bizet, and also some Broadway tunes. There was even a cancan performed to the "Toreador Song" from Carmen and choreographed by James Gray. What fun! Guest artist soprano Amy Shoremount-Obra performed John Duke's Four Poems by Emily Dickinson, using her generous instrument, lovely phrasing, and crisp enunciation to bring out Mr. Duke's appealing vocal line and Ms. Dickinson's deeply felt text. Andrew Rosenblum's piano did justice to Mr. Duke's many moods bringing out the tumultuousness of "Heart, we will forget him!" and the sweetness of "Nobody knows this little Rose". She also performed Mr. Roven's duet "The Promise" with Mr. Fields; the texture of the two voices blending and overlapping was quite attractive but Jane Hirshfield's poetry went by without our comprehension. Tobias Greenhalgh provided a preview of an aria from John Adams' Dr. Atomic, which we will be reviewing this summer at Santa Fe Opera. His performance was a deeply felt and expressive one but we cannot say that John Donne's text wanted to be set to music. The remainder of the program comprised selections from the new recording. Mr. Roven related that all the works on the CD were written by living composers. This is probably a big drawing card for many music lovers since Weill Recital Hall was packed. Contemporary vocal music is just not our taste, as regular readers already know. We keep listening and hoping to find something we like but it rarely happens. We were surprised to have liked the John Duke settings as much as we did. Accompanied by Mr. Brofman, Mr. Greenhalgh sang Four Surreal Songs by Mr. Roven, settings of text by Paul Éluard. Mr. Greenhalgh has a firmly centered baritone and used every color in his vocal palette to make sense of rather senseless poetry. We liked some of the piano writing, especially the descending arpeggi of "Arc of Your Eyes". Accompanied by Adam Nielsen, Steven LaBrie exhibited a great deal of vocal power, an interesting texture, and some fine French diction for Benjamin C.S. Boyle's Le passage des rêves, a setting of text by Paul Veléry. We liked Mr. Nielsen's delicate piano in "La dormeuse". Lori Laitman's setting of text by Joan Joffe Hall "The Joy of Uncreating" did not ring our bell. We wondered whether the poet of "Illumination" was writing of the experience of waking from a coma; the piano part was far more appealing than the vocal line. Jarrett Ott's appealing baritone served well for Jake Heggie's Of Laughter and Farewell. Vachel Lindsay's text "Under the Blessing of your Psyche Wings" rhymed and scanned and we wished the vocal line had done more with it. The piano part, played by Daniel Zelibor, for "By the Spring, at Sunset" was more appealing than the vocal line. Jennifer Higdon, composer of the opera Cold Mountain, which we heard at Santa Fe Opera, set excerpts of Walt Whitman's poem "When Lilacs Last in the Dooryard Bloom'd" and created a piano and baritone arrangement specifically for Mr. Ott and dedicated the work to him. We kept wishing that we could catch the fragrance of our favorite flower, the one for which we visit Lilac Walk in Central Park every May. We did not. We couldn't keep from thinking about "Le temps des Lilas" by Chausson which gives us an olfactory thrill. Fortunately, the final work on the program appealed to our ears to a far greater extent. Mr. Roven took to the piano himself for his composition "Remember", setting of a text by the 19th c. English poet Christina Rossetti. Perhaps it was the fact that the sentiment was meaningful and comprehensible; perhaps it was the fact that the text rhymed and scanned; perhaps it was the sound of all three baritones together. (Mr. Roven pointed out that the recording was made with each artist recording in a different city and tracks assembled later. But we were privileged to hear them singing it together for the first time!) In any case, it ended the recital on an auspicious note. The enthusiasm of the audience makes us want to encourage you to buy the CD, if contemporary music is to your taste. On our part, we prefer to hear the artists singing other material. We'd love to hear Ms. Shoremount-Obra sing some Wagner. We yearn to hear Mr. LaBrie as Escamillo. Mr. Greenhalgh's Eugene Onegin would throw us into a joyous delirium. As far as Mr. Ott, well, we are going to hear him sing Maximilian in Bernstein's Candide within 3 months in Santa Fe. Watch out for the review!